The MetaTrader 4 is unique program for both newbies and experienced traders that has in-built thousands of awesome features. The platform remains to be number one not only for traders, but also brokers, who are playing the major role in the currency exchange market. Since there are thousands of brokers on MetaTrader 4, it can be difficult to choose and add the one you need. 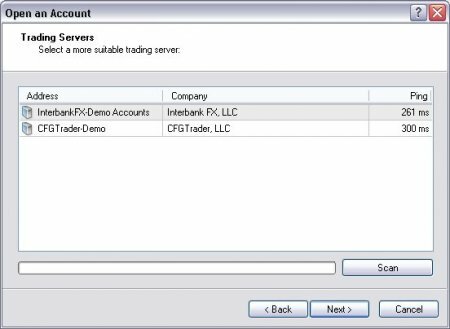 So, how to add broker to MT4? The first thing you need to get is a .srv file for certain broker. Any broker’s .srv file is usually free and absolutely accessible. Then Save this .srv file to your Meta Trader 4/config directory. You'll see other brokers in this list already. Launch Metatrader 4 once again. On the second step of opening a new account, the new server will be visible in the following list (screenshot attached). Then select the needed server. Sometimes, MT4 has a problem where the opened chart works only with the server under which it was opened. In case you have certain charts based on your IBFX demo, you will need to switch to your Alpari account to open new charts. This issue can be also solved by using different profiles for different servers. As far as you can see, adding broker to your MT4 is really quick and easy!